Ryan Pace started 2018 with a target on his back. The Chicago Bears GM had just concluded his third straight losing season. His roster looked like a hollowed out disaster in lots of places. Worst of all his relationship with the head coach had reportedly gotten contentious behind the scenes. Some wondered if ownership might decide to move on from him. They didn’t. Instead they gave him a minor contract extension with a clear aim. His next coaching hire would be tied to him at the hip. Their success or failure would be entirely his. With that brief respite, Pace set about crafting a plan. He knew the upcoming offseason to come could afford few mistakes. The time of patience was at an end. He had to make his big push to get this team winning some football games. Over the course of the next several months, he made a host of moves that completely transformed the organization from top to bottom. Ones that should now have him in position to win Executive of the Year. Pace knew what he wanted from the moment he dismissed John Fox in January. He wanted what his former team the New Orleans Saints had: an offensive head coach who could groom Mitch Trubisky into the player he should be and breath some fresh air into an organization stuck in the past. Trubisky is now on pace for over 4,000 passing yards with 33 touchdowns and just 13 interceptions. That would be by far the best passing season in Bears history. The offense is ranked in the top 10 for the first time since 2013 and the team sits at 6-3 on the year, already one game better than their 2017 win total. Probably the most forgotten but brilliant ploy of the offseason for Pace. Rather than franchise tag Fuller after his standout 2017 season, he chose the somewhat unorthodox and risk transition tag. This basically turned the corner into a restricted free agent, meaning another team could make him an offer. This indeed happened when Green Bay attempted to sign him. Pace wasted no time matching the deal, locking Fuller up for the next four years at $14 million per season. Looking back, it looks like a steal. Fuller has only gotten better since. He already has four interceptions on the season with another 10 passes defended. The Bears needed a go-to wide receiver to help Trubisky blossom. They thought they had one in Alshon Jeffery but the two sides just couldn’t find common ground on a deal the year before. So this year Pace absolutely had to strike hard and fast to get that pass target. The guy he wanted from the start was former Jacksonville Jaguar Allen Robinson. It turned out the interest was mutual. Robinson, who’d been a Pro Bowler in 2015, was coming off a torn ACL but believed he could be a big part of the new offense that Nagy was installing. It certainly looks that way. Despite missing two games and playing one other with a pulled groin, he has 418 yards and four touchdowns. Speed is everything in the NFL. Teams that have it tend to do well, especially on offense. The Bears hadn’t had a genuine deep threat on their offense since Johnny Knox six years ago. They wanted to change that. They got their guy in former Atlanta speedster Taylor Gabriel. It’s been money well spent. He has 426 yards which lead the team. A lot of people were taken aback when the Bears offered such a solid contract to Trey Burton, a man who’d essentially been a backup tight end during his time in Philadelphia. The feeling was he had starting talent but had been stuck on a loaded depth chart. He was athletic and a perfect fit for their system. His 411 yards and five touchdowns prove they were right in thinking that. Of all the moves Pace made in free agency, this one is being called into question the most. Kickers have been his Achilles heel since he arrived in 2015. He released Robbie Gould, signed Connor Barth who was a train wreck and now his pricey acquisition in Parkey has already missed seven kicks in nine games including four against Detroit. Not ideal. Amukamara wasn’t a stat guy in 2017 but his coverage was a big reason the defense had a good year. The Bears rewarded him with a three-year deal to return. He’s since picked up right where he left off, only this time he’s actually intercepting the ball. His two picks this year were the first he’s had in three seasons. One proved the difference in a big win over Seattle too. Pace felt reuniting Lynch, who’d flamed out in San Francisco, with his former coach Vic Fangio would help relight that fire he’d shown back in 2014. So far, so good. Lynch has three sacks this season, which is a half sack shy of his total from the past two years combined. He has an additional eight hits on the QB and three tackles for loss as well. The young linebacker out of Georgia came with tons of credibility after leading his team to a national title game his final season in college. However, his extended contract holdout after being drafted led to him missing all of training camp and the preseason. It might take him all season to even get acclimated to the defense, right? Nope. Smith already has 64 tackles (2nd on team), three sacks, and a forced fumble. One of the most proven and polished offensive linemen in the entire 2018 class out of Iowa. To think this was the case with Daniels only being 20-years old. There was still so much growing for him to do. Even so, the Bears didn’t play him right away for fear he wasn’t ready for complex NFL pressure packages. Their patience paid off. Daniels is now their starting left guard and has yet to give up a sack in 159 pass blocking snaps. Pace shocked a lot of people when he gave up his 2019 second round pick to move up from the fourth round back into the second this year. The prize was worth it to him though when the Bears snagged Memphis wide receiver Anthony Miller. His talent, polish and ridiculous effort was everything they wanted. It’s not hard to see why. With 332 yards and four touchdowns, his ability is shining brighter with each passing week. 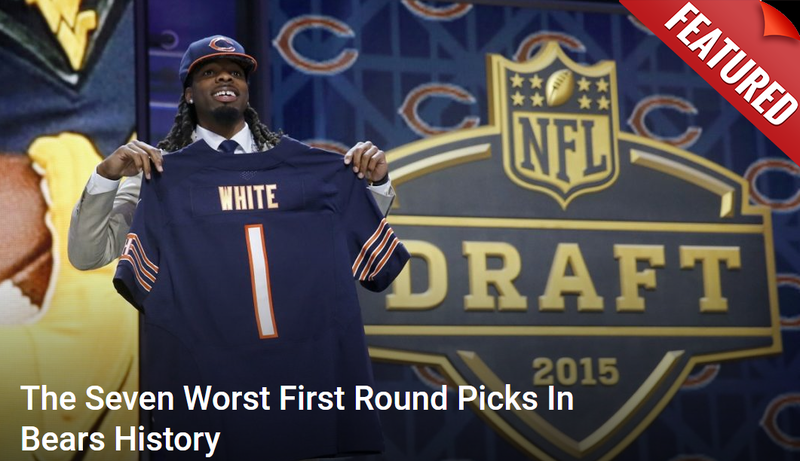 There was a lot of disappointment when the Bears picked the young inside linebacker from Western Kentucky. While Joel Iyiegbuniwe was an impressive athlete, it was felt the picking of him robbed the team of a chance to fill another position of need. Especially after they’d just taken Smith. Pace stuck to his guns. Though Iyiegbuniwe hasn’t seen the field on defense yet, he’s tied for the team lead in tackles on special teams. He’s been the biggest revelation of the entire draft class. An unknown from Delaware of all places, Bilal Nichols is fast developing into a force at defensive end. His mix of power and quickness is evident each week and offensive lines have had a hard time stopping him. He’s got 1.5 sacks, three tackles for loss, and two forced fumbles in limited work. It’s hard to feel bad about that. To this point, the 6th rounder from Utah has had the quietest start to his career. Fitts had some nice moments in the preseason with a couple of sacks but since ascending to the game day lineup, he’s done little. In 30 pass rush opportunities, he’s yet to even record a single pressure on the quarterback. While he hasn’t made a regular season impact yet, Javon Wims was a star in the preseason. He showcased all of the natural athletic talents he had at Georgia with that 6’3 frame and good speed. His issue is a typical one for young receivers. His route running needs work. That should come with more time. Given the likely fate of Kevin White next year, his chances to play will increase soon enough. The cherry on the sundae. The icing on the cake. Use any of the classic descriptions and they all apply. Pace needed one more bold move to bring the entire offseason together and boy did he deliver. It took a good degree of luck but also negotiating prowess and a willingness to be bold. All of that came together when he nabbed Khalil Mack. This is one of the best defensive players in football. He’s 27-years old and in his prime. A likely Hall of Fame pass rusher if his career arc continues on its current trajectory for the next 5-6 years. Pace gave up four draft picks including two 1st rounders to make it happen, but he also got a 2nd rounder in return. Mack already has seven sacks on the season. He’s on course to have 12 by the end of the year, which would tie the third-highest mark in franchise history. That doesn’t even cover how great he’s also been against the run. The guy is a superstar and the main reason the Bears defense is officially back. Ryan Pace is three games away from having his first winning team since becoming Bears GM, and it’s all because of the outstanding work he’s done this past offseason. It was as close to flawless as any exec could ever hope to get.